For decades at Mid Cal Moving & Storage, our Oakdale moving company has provided valuable moving services for residential, commercial, and specialty relocations. BBB-Accredited and a proud agent of Bekins Van Lines, we have the resources and support needed to carry out any relocation request, large or small. As expert moving professionals with high standards, our Oakdale movers are ready to assist you from packing to unpacking for all of your local or long-distance moving needs. Personal and custom service makes our Oakdale movers the best in the area. Paired with a personal move coordinator, you’ll be guided every step of the way from start to finish so your move will be handled the way you want it to be. Get your questions answered and your concerns addressed with our moving experts, and get a hassle and stress-free relocation plan customized to your specific requirements, whether they be large or small, long-distance or local. 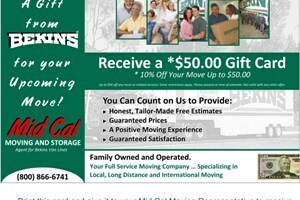 As the premier movers in Oakdale, Mid Cal Moving & Storage offers unprecedented moving services and support to suit any budget. Speak with one of our knowledgeable representatives today to learn more about the comprehensive services we offer. Call us or fill out our online form to receive your free, no-obligation estimate.